AAS #4: Supernova expands as we watch! Astronomers using the Chandra X-Ray Observatory have just released an extraordinarily cool animation. 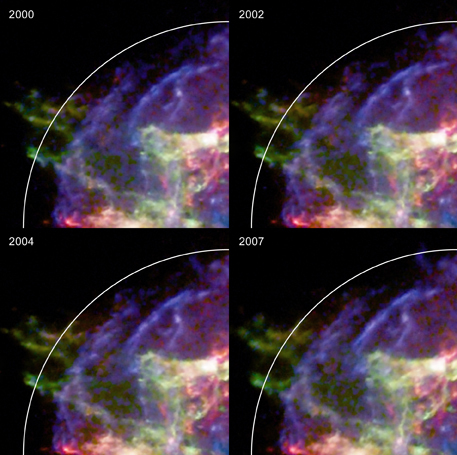 Composed of images taken between 2000 and 2007, it shows the supernova remnant Cas A literally expanding as you watch it! See the little white dot in the center? That used to be a star, a big one. About 330 years ago*, that star blew up in a titanic supernova explosion. Several octillion tons of material screamed outward from the star at a good fraction of the speed of light, leaving behind an ultradense neutron star, the remains of the star’s core. So, that dot in the center? It’s an object a dozen kilometers across that has about the same mass as our entire Sun. It has a density of about 100 million tons per cubic centimeter. That’s roughly the mass of every single car in the United States, crushed into a cube the size of, oh, say, a mini marshmallow. The outer layers of the explodey star are what you’re seeing here in this animation. Rushing outward at thousands of kilometers per second, they are heated by the explosion itself, by the decay of radioactive materials forged in the blast, and by magnetic processes when the spinning neutron star interacts with the gas. All of these together heat the gas to millions of degrees, and it glows in X-rays. The Chandra X-Ray Observatory can see these high-energy photons, and so astronomers use it to observe Cas A (so called because it is in the constellation of Cassiopaeia, and is also a radio source, which were traditionally named after letters in the alphabet). In fact, Chandra observes this supernova remnant quite often, so the astronomers took the images made over the past 8 years and created this animation. It shows the expansion of the debris as the gas moves outward from the point in space where the original explosion happened. It’s like watching a nuclear blast in super duper slomo. Still images showing the expansion. Credit: NASA/CXC/SAO/D.Patnaude et al. But don’t be fooled by the apparent peacefulness and calm you see here. Supernovae explosions are among the most violent events in the Universe. If one were to happen within 20 light years of the Earth, it could cause a mass extinction through the destruction of our ozone layer. Happily, no star capable of blowing up is that close. Cas A is about 10,000 light years away, so we’re in no danger from it either. The flip side of that is that the iron in our blood, the calcium in our bones, and even the gold in our jewelry is created in supernovae blasts. The incredible heat and pressure of the explosion forces the gas to undergo nuclear fusion, alchemically creating the heavy elements life is based on. A supernova could wipe out life on a nearby planet, but we literally owe our existence to such supernovae. I could go into some kind of "Lion King" Circle of Life speech, but I think you get my point. An interesting tidbit: it’s been thought for years that high-energy particles that slam into our atmosphere all the time, called cosmic rays, were accelerated to their high speeds in supernovae remnants like Cas A. Interestingly, this animation indicates the gas is expanding more slowly than it should given how much energy is released in the explosion, which in turn means that lost energy is going somewhere. Astronomers think it’s going into the production of those cosmic rays, which eat up about 35% of the explosion energy. Animations like this are more than just cool to look at (though they are very cool to look at). They can reveal a huge amount of information about the explosions as well. One of my favorite things about astronomy — and I have a lot of favorite things — is that we can create gorgeous images and movies, and they are a wonder to see… but they also teach us stuff. And not only that, the stuff we learn is fundamental to our very existence: information on how we got to be here, how the elements in our bodies were made, and even how the Universe itself changes over time. * Whenever I mention distances and time, people get confused. Casa A is 10,000 or so light years away, so don’t I mean 10,330 years ago? No, I don’t. This is terribly confusing, and someday I’ll write up a total explanation, but because of relativity, Einstein, and the speed of light, you can think of time flowing at the same speed as light. Literally, as far as we are concerned, that star really did blow up 330 years ago, not 10,330.